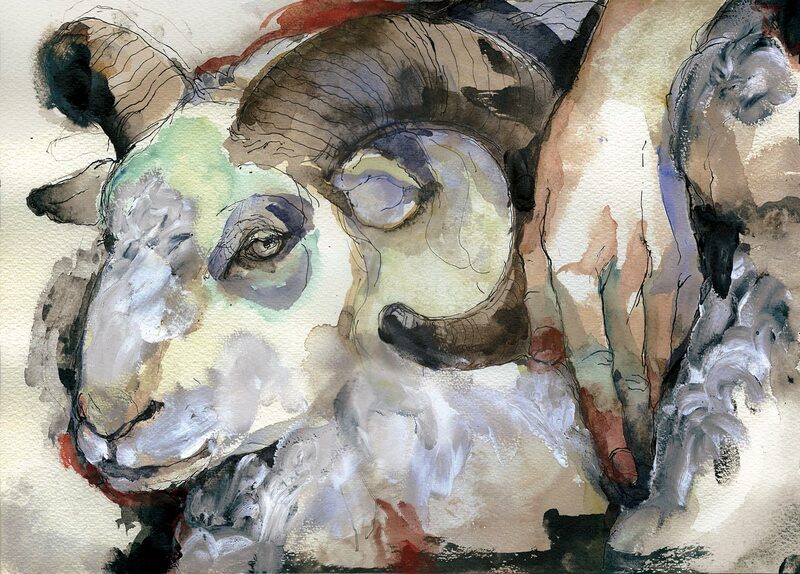 The Wild sheep (Ovis ammon) was domesticated in the Euphrates-Tigris region about 11.000 years ago. Domestic sheep are known in Iran and Turkey since 9.000 years. Afterwards domestic sheep were distributed by men, to South Turkmenia 8.000-7.000 years ago, to India 7.000-5.000 years ago, to South East Asia 6.000 years ago and to China 4.000 years ago. About 6.000 years ago the sheep was brought also to Central Europe and 4.000 years ago to England and Scandinavia. Wild sheep never lived in Africa, but domestic sheep are known in Libya since 7.000 years and in Egypt since 6.000 years. 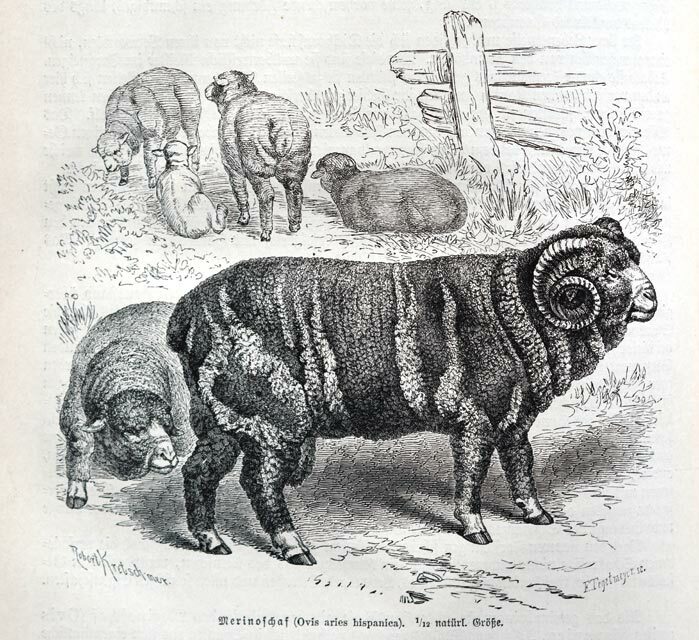 The rather small size of Wild sheep was the ideal game for meat and later the reason for its domestication. Topics for domestication of sheep were to gain smaller size, shorter horns and a tame character. Even until today domestic sheep still have a large variety and plasticity to adapt easily to different husbandry conditions. Therefore they can be kept in several climates and habitats and new domestication goals can be achieved by selection and crossbreeding rather easily. 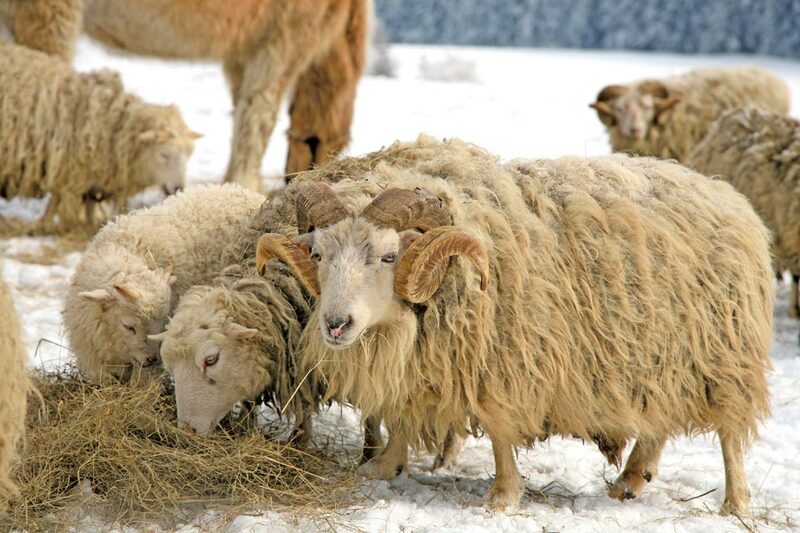 When the domestic sheep showed 5.000 years ago the first wool fleece, their value became much higher and already 2.500 years ago the antique Greek and Romans kept sheep with a very fine Merino wool. 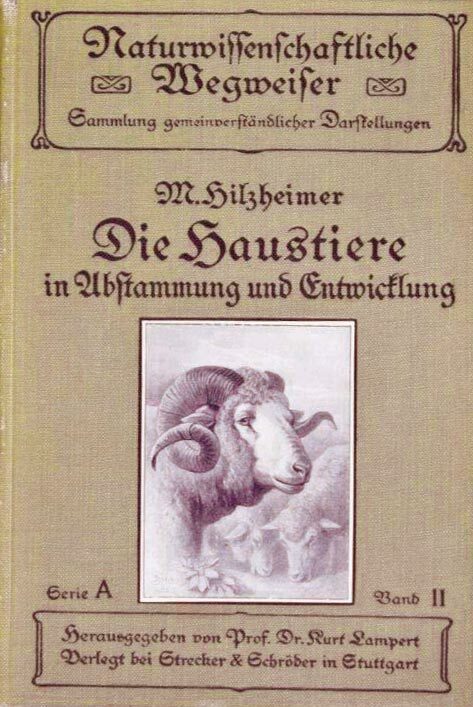 On the other hand, when in 1870 the wool price decreased, the German sheep holders changed the sheep type from a sheep for wool production to sheep breeds with high portion of meat. To summarize, the domestication of Wild sheep had and has also today 4 major goals: To deliver wool & merino, skin, meat and milk. Over the centuries very specialized breeds for the different products were cultivated. Today more than one billion sheep are kept worldwide, most of them in Asia (378 million). But because of their higher productivity these specialized breeds dismissed the original breeds which became endangered or extinct. Most of these traditional breeds are kept today only by some specialists or sheep breed lovers who want to save for future generations these old breeds as a proof for mankind’s culture. One of these old breeds is the East Prussian Skudde which is the smallest and one of the eldest German sheep breeds. The Skudde is a nordic, rather small and slender built, short-tailed heather sheep. Its original homeland was East Prussia and the Baltic States where it was kept since medieval times until World War II. Today the Skudde is registered in the Red Data Book for Livestock animals and only a very few small herds with altogether 1.000-2.000 sheep can be found today, most of them in some zoos and on private grounds in Germany. All these stocks can be traced back to a very few individuals which were saved and bred by a few committed breeders. Remarkable are the Skudde herds in the zoos in Munich Zoo and Leipzig. Of course inbreeding can be a danger today, for example the herd in the Leipzig Zoo goes back on only one ewe and her son! The most noticeable feature of the Skudde buck is the imposing snail horn. The ewes are hornless or carry horn stumps. The animals are small and slender. Bucks have a wither height of 50-65 cm and weigh between 35 and 50 kg. Ewes are smaller, 25-40 kg body weight and 45-60 cm wither height. The wool mixture, which is typical for this breed, consists of fine wool fibres, dispersed with short hairs and course cover hair. The fleece can be white, brown, black or grey. White Skuddes have often small pigment spots on the head. The tail is short with bristly hairs. Lambs have a rust-coloured marking in the nape of the neck and on the legs. But this colour disappears in adults. Because of its small size the Skudde is mostly not kept for its meat, although the meat is a delicacy. But the Skudde is very well suited for pasturing more barren areas and to contribute so to conservation of landscape. As it has no food preferences, this sheep breed is undemanding and feed even on stinging nettles and sorrel. Skuddes come into heat aseasonally and lambs are born at any time of the year. As a rule 3 lambings are possible in 2 years. The Skudde is sexually precocious and its first pairing is already possible with an age of 8 months. 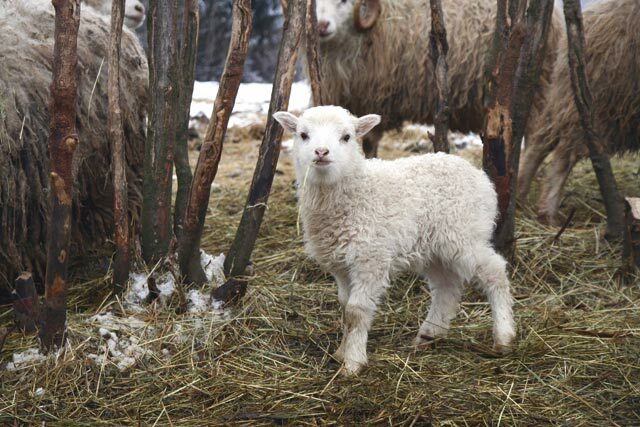 This high reproduction rate was at least the guarantee for the survival of this small German Sheep breed after its collapse in the end of the 1940ies. Born: January 30th, 1942 in Dessau. Studied at Kiel University and University of Mﾃｼnster. 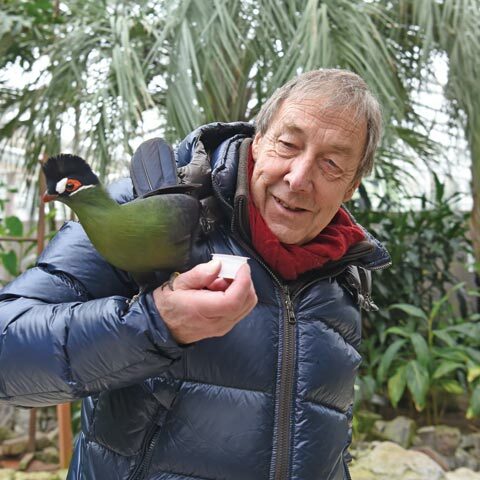 Former CEO and cdirector of the Berlin Zoo/Aquarium, which has a history of 170 years. He is one of the leading biologist in Europe as well as a zoo science expert and marine biologist. He works together with Motofumi TAI as a zoo and aquarium consultant, helping to build and renew zoos and aquariums around the world.